Sarah Latto studied music at Cambridge University, where she held a choral scholarship with Sidney Sussex College. She studied conducting with Stephen Layton, and performed in masterclasses with Stephen Cleobury, Andrew Nethsingha and Timothy Brown. 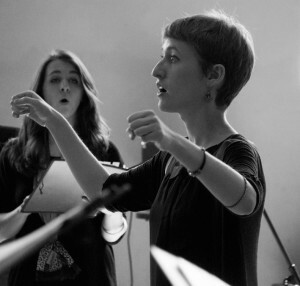 After graduating, Sarah continued her conducting studies in Brighton, where she worked closely with Brighton Early Music Festival as a vocal coach and director. In 2014, she was awarded the Association of British Choral Directors bursary scheme for young conductors, and in 2015 received a Conducting Fellowship to the Norfolk Chamber Music Course at Yale University. Sarah was appointed Conducting Scholar with Genesis Sixteen from 2015-16, a young artists scheme run by The Sixteen designed to nurture the next generation of talented ensemble singers. She received mentoring and tuition from Harry Christophers and Eamonn Dougan during the year long programme, during which she conducted the group in concert and in broadcasts on BBC Radio 3. Sarah is Artistic Director of young professional ensemble Echo, who made their St John Smiths Square debut in July 2017. They were selected as Chiltern Arts Festival Young Artists last year and have since performed at Queen Elizabeth Hall alongside the London Philharmonic Orchestra and collaborated with artist Polly Apfelbaum at the Ikon Gallery in Birmingham. In 2019, Echo are a featured artist at the Ryedale Festival in Yorkshire. Alongside conducting, Sarah is a keen accompanist and orchestrator, and runs a composer collective called The Coveryard. She also loves cycling, politics and attempting to do yoga. Sarah is thrilled to be working with Ex Cathedra as its first Associate Conductor, and looks forward to the originality, scale and breadth of projects.